If you have any questions regarding the extended health care claims conversion to Manulife, please call the Plan Administrators office at 1-877-926-4537 (Bilsland Griffith). Please click here to view the letter mailed to members regarding the conversion. Please click here to view the Manulife brochure. Please click here for information on the 2017 golf tournament. 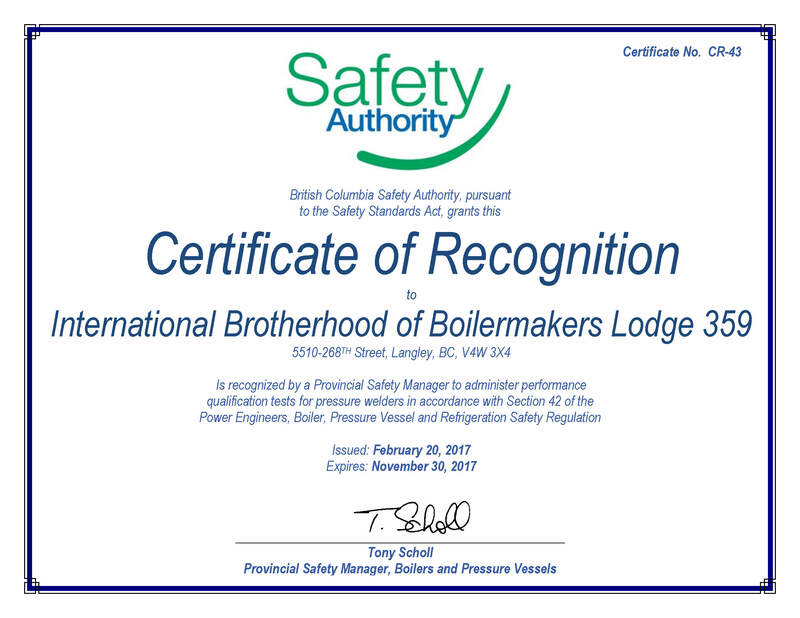 On February 20, 2017 Boilermakers Lodge 359 received it’s Certificate of Recognition from the BC Safety Authority. What does this mean? 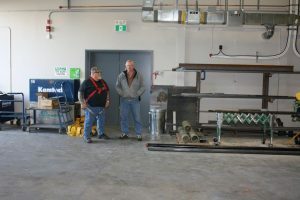 It means that Lodge 359 can now provide qualification performance pressure weld testing for our members at the Joe Kiwior – Ivan Shook Training Centre. 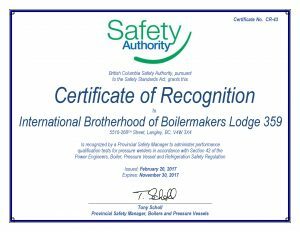 Any Lodge 359 member that wants to upgrade their welders log book and test should make arrangements through Gord Weel or his assistant Jamie White by calling the general office during regular business hours, 778.369.3590. On December 31st, 2016 I was in contact with my neighbours the Gotro family in Kamloops who had lost their 12 year old Grandson in November of 2016. Kai Gotro was a special needs child who passed away at Canuck Place Children’s Hospice. From my understanding, Jean Gotro was somehow in contact with the Luyt family in Mission. The Luyt’s have a 2 1/2 year old daughter named Leila who is also special needs. 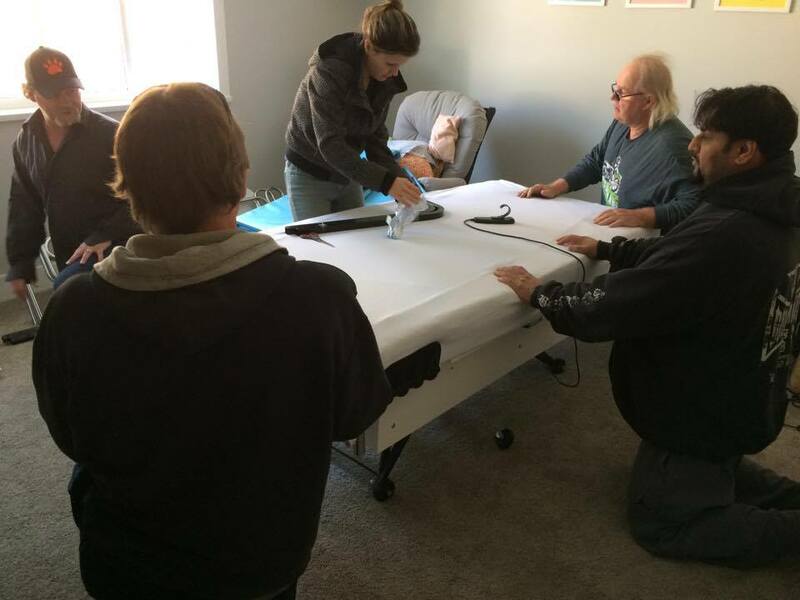 The Gotro family donated their medical bed to the Luyt family but were facing a few obstacles in getting the bed to Mission from Kamloops. 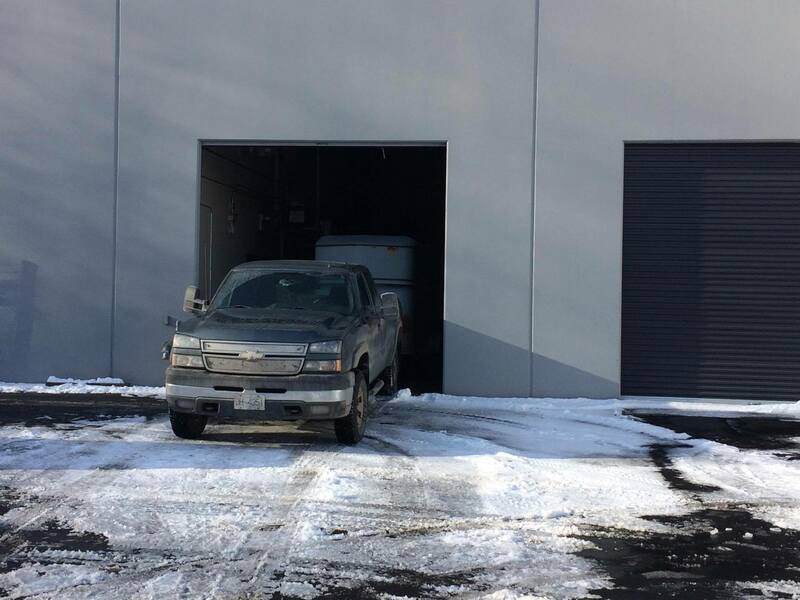 Some local cartage outfits were called to price out a delivery and the least expensive was approximately $800.00. I contacted Jim Wymer and discussed this situation which was followed by Jim’s usual reply, “set everything up with the families, I’ll find a trailer to fit the job”. 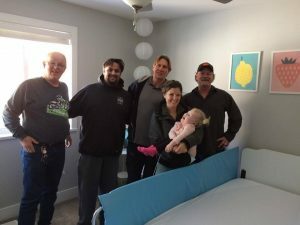 The Gotro family was concerned about the care of this $7500 bed, stating that it has 2 electric motors to work the raising/tilting functions, and they wanted to make sure that the bed would not be out in the elements. 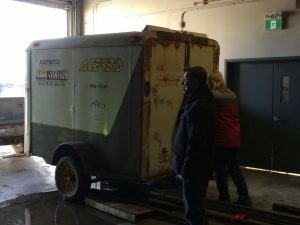 Jim sourced out an enclosed trailer from his ice racing friends, who gladly donated the use of the trailer for this cause. We then reached out on Boilermaker social media sites looking for some volunteer manpower to help out loading and unloading the trailer, and it wasn’t long before we had enough Boilermakers willing to help. From Kamloops, we had Brothers Shawn Rohatyn, Jim Wymer, my 2 son’s Cale Giese (UA 170 Steamfitter Apprentice) and Andrew Giese (Electrician). From the Mission/Abbotsford area, Brothers Craig Dunnett, Mark Buss and Sat Chatta. 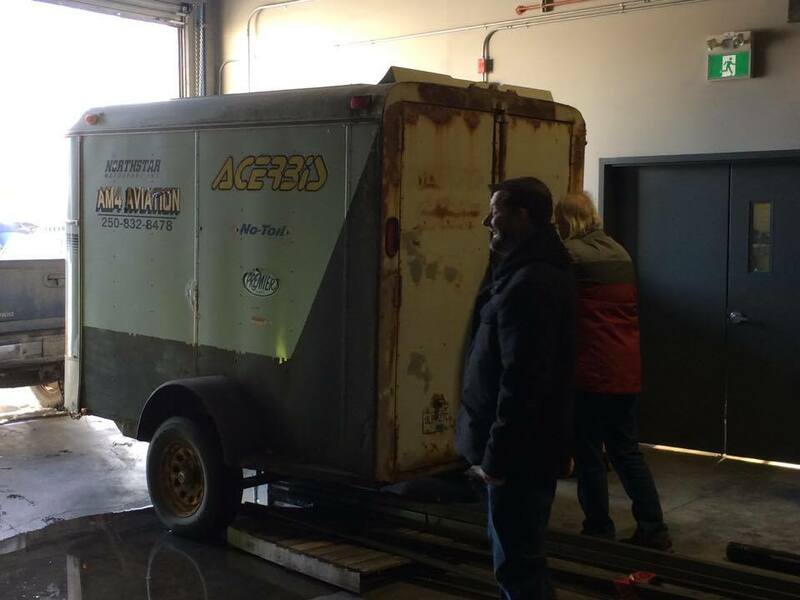 Next was a phone called to Gord Weel to see if we could store the trailer in the 359 shop until we could deliver the bed, and with no questions asked the trailer had a temporary home overnight. 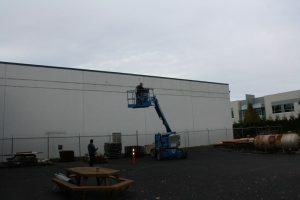 The bed was now set to be delivered the day after the January regular monthly Union meeting. The delivery in Mission was a little trickier than the loading in Kamloops due to the amount of stairs that had to be maneuvered, but we managed to get the job done without scuffing any walls…lol. It’s always nice to help out in communities where families are in need and all who contributed were happy to do so. A special thank you goes out to all involved in assisting the Luyt family in securing this bed for their daughter. 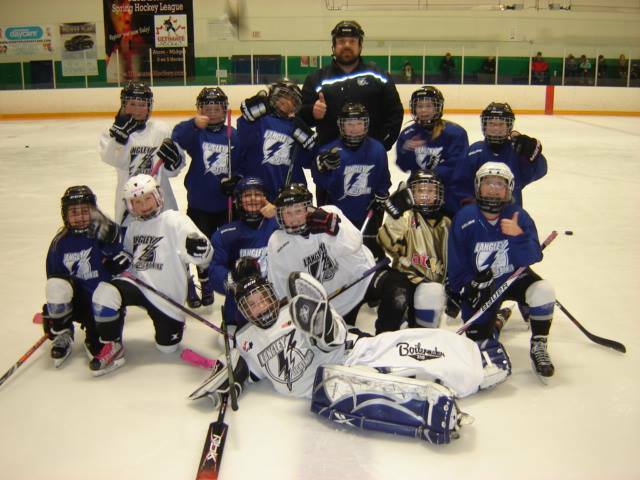 The Langley Lightning Girls Atom C Hockey Team would like to thank the Boilermakers Union and their members for the generous donation of $500.00 to the league this year. 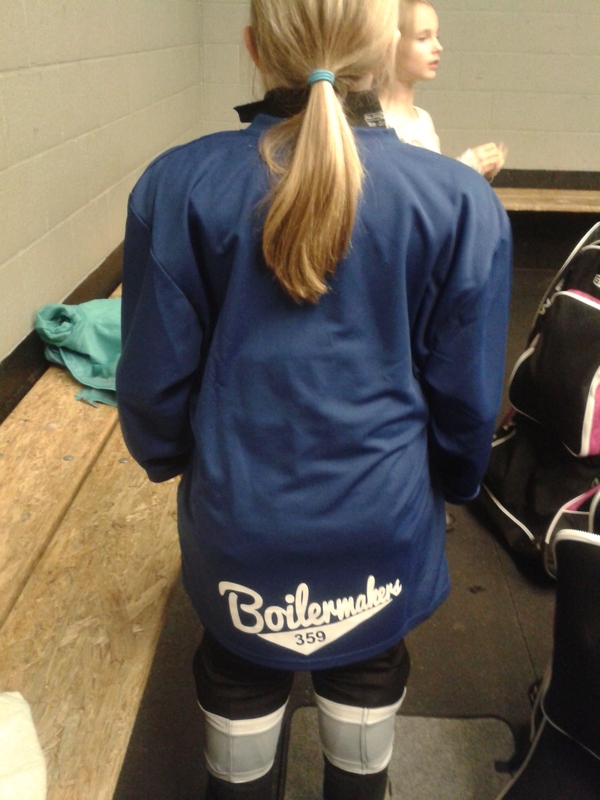 The money donated paid for practice jersey’s for each girl, displaying Boilermakers Lodge 359 on the their backs. 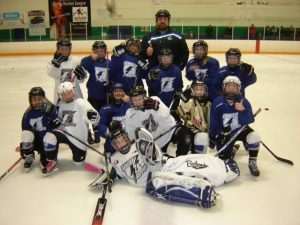 The donation also supported the team’s attendance to the “Angel’s on Ice” Winter Tournament. The team is very appreciative and wear their jersey’s proudly. 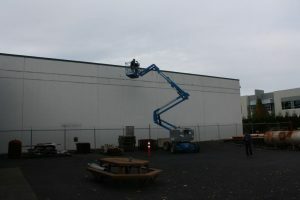 The Boilermakers annual Christmas meeting was held December 7th at the Cascades Casino in Langley. During the meeting the second annual Cody Brothers Bursary award of $400 was presented to Kyle Jenkins by Brother Rick Cody on behalf of his brothers,. 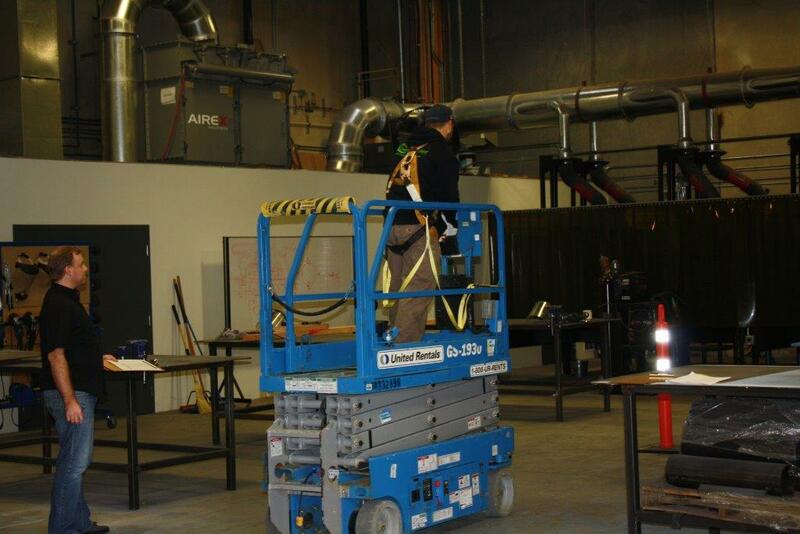 The award is intended to recognize an individuals commitment to the apprenticeship program. Brothers Bill Rogers and Greg Pierce were also thanked for their service as Trustees on the Apprenticeship and Trade Advancement Committee. Brother Bill Rogers receiving a plaque and jacket at the Christmas meeting and Brother Greg Pierce receiving a plaque and jacket at the pension dinner in September. 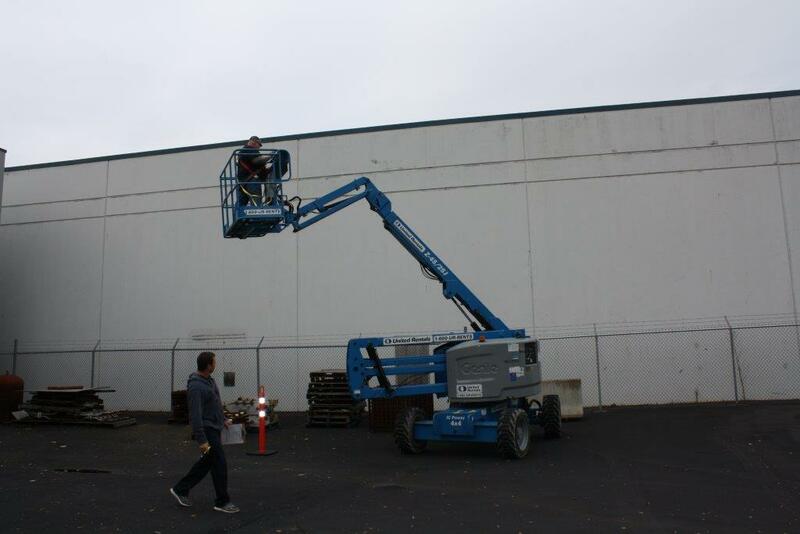 An Aerial Boom Lift course was held October 19th with 5 members receiving certification on both Scissor Lift and Aerial Boom Lift. 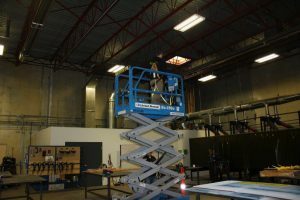 Apprenticeship and Training is now overseeing the Pro-Jo program. Pro-Jo inquiries and reports can be sent Gord Weel. The table below is the Apprentice training schedule for 2017. If you have an old work-related injury that you are receiving a WCB pension for, and you are continuing to work, the pension you are getting is likely a PFI (permanent functional impairment) pension and it is meant to compensate you for the odd day here and there that you may miss due to the injury. The WCB calls this “normal fluctuations” of the condition. So for example if you have a 5% pension for a back injury you had some years ago, you would not go back to the WCB to seek wage loss benefits if you missed two days from work due to a minor flare-up. If however your back gets so bad that you are off for the next 3 months, or if it gets so bad that you will never work again, this is called a “reopening.” In this case you need to see your doctor FIRST. You need to have the support of your doctor in order to get a reopening. Your doctor should be prepared to use the magic WCB words, that there has been a “significant change” in your condition; that is, that it is something beyond the normal fluctuations to be expected, and for which you got your PFI pension. Shirley has a 2.5% PFI pension for chronic pain in her right arm. She got modified duties at work and while she does suffer with pain and takes pain medications, she has managed to continue working for the last 4 years. Over a few weeks however Shirley’s arm has started aching more than usual. If it is just sore for a day or two, that will not get her a reopening, but Shirley needs to keep working and her arm gets worse and worse. She goes to her family physician who says she needs to take two weeks off to rest the arm and get physiotherapy. At the end of two weeks her arm is no better and her doctor sends in a Physician’s Progress Report saying that Shirley needs to see a specialist and asking the WCB to expedite an appointment. safe work. So for us, it remains the WCB. At this point the WCB will need to adjudicate whether Shirley is entitled to a reopening. Hopefully, with her doctor’s support, she will get one and will receive wage loss benefits for the period of time that she is off work. Here’s an important point: if your pension is just for chronic pain, the WCB may often say that “pain is pain” and so it’s “just a fluctuation.” This is just plain wrong, and it is NOT their official policy. If you have pain that is bothersome but you are able to continue working, and then it eventually gets so bad that you can no longer work, that is a “significant change” and you should get a reopening. We have to argue these appeals all the time. Remember, don’t take no for an answer. If your condition has become disabling and they won’t give you a reopening, appeal it! One other warning however: if you have a WCB condition, for example a bad back, and you do something outside of the workplace that aggravates it, like picking up your 25 lb. dog, the WCB will say that is not their responsibility. Even though you could pick up your 25 lb. 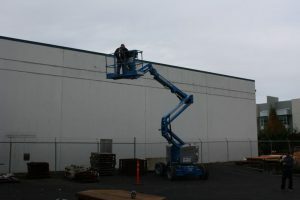 dog without hurting yourself before you got injured on the job, if the activity that irritates it happens away from work, the WCB will not cover it. So be careful! Effective April 1st, 2017, your extended health claims (ie. all prescription drugs, vision care, ambulance and paramedical services such as physiotherapy, chiropractic, and massage) will be submitted to Manulife for reimbursement. Bilsland Griffith will no longer pay these extended health claims but will continue to pay your eligible dental claims. Along with the change to Manulife, which will take effect on April 1st, 2017, the Trustees of your Plan are pleased to inform you that you will be provided with a pay direct drug card. This means that when you are purchasing your prescription drugs from a pharmacy, the pharmacist will be able to verify coverage at the till and be reimbursed directly for the portion covered by your Plan. You will only have to pay for the difference between the covered amount and the cost of the prescription. Sometime in mid-March, you will receive your pay direct drug card from Manulife. This card will also have all of the contact information provided above for your out of country coverage. Please note that all eligible members of the Plan, including retirees who are currently enrolled for coverage, will receive a pay direct drug card. Please ensure that the Plan Administrator – Bilsland Griffith – has your correct mailing address so that you receive your pay direct drug card from Manulife. In addition to the card, you will receive a new Plan booklet and a pamphlet for coverage details for the out of country / emergency travel benefits. Reminder: Manulife will take over this coverage on April 1, 2017. Any claims you have for extended health that were incurred before April 1, 2017 will continue to be paid by Bilsland Griffith and should be submitted to their office at the address provided on this notice. There will be a newsletter issued the last week of February with additional details regarding the move to Manulife. The 2017 Boilermaker Scholarship notification and application form have now been posted on the Membership Services page within the “Scholarships” pull down menu. To be eligible, the applicant must be a son, daughter, legally adopted child or dependent of a member in good standing. Applications are limited to high school seniors who will be entering their first year of academic study at a degree-granting, accredited college or university within one year of the their high school graduation. All members with eligible children are encouraged to take advantage of this program. 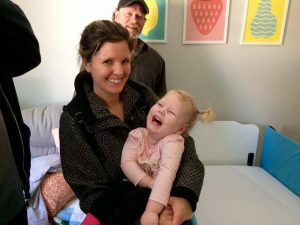 Boilermakers working at the Fort Nelson Spectra Energy site have reached out in support of the local community to assist with a great fundraising program for a young girl with a very rare congenital disorder known as CDG (Congenital Disorder of Glycosylation). Our members have organized a number of 50/50 card draws to help assist in the fundraising efforts. Lodge 359 was also contacted to determine if there were any other measures that could be taken to continue with the fundraising efforts. As a result, at our last monthly Union meeting a motion was put forward and unanimously approved to donate $4000.00 to the FOG or Foundation Glycosylation in Saint John, New Brunswick. The Foundation Glycosylation (the FoG) supports research for the development of therapies targeting CDG, helps raise awareness of the disorder, and advocates for individuals living with these rare enzyme deficiencies. A letter acknowledging the donation by 359’s membership will soon be hand delivered to the parents of Farrah by the crew members. We sincerely wish the family well. Our members elect local lodge officers and delegates to the Consolidated Convention held every five years. For this 33rd Consolidated Convention held on July 18th to July 21st, 2016 local 359 members were able to send 7 delegates; Dave French, Jordan Streng, Gord Weel, Jim Wymer, Palmer Allan, Ken Noga and by virtue of office Business Manager Martin Nicholson. This Convention was held at Caesars Palace in Las Vegas where the delegates set forth the rules and policies for the next 5 years, which is both a serious responsibility and a privilege. Our first day started with a speech from International President Newton Jones on 3 gigantic screens that projected video footage and images of boilermakers at work comparing music to the boilermaker craft like a musician, the work, practice, sacrifice and dedication of a boilermaker often goes unseen”. This was followed by guest speakers which included topics about the United Mine Workers to the plight of the working class in a nation where unions are under attack, the middle class is shrinking and the divide between the ultra-rich and everyone else continues to grow. Retired U.S. navy seal Marcus Luttrell, the author of “Lone Survivor” the basis for the 2013 movie comparing the battle field to everyday life, reminding the delegates that “anything is possible if you just work hard at it”. Then we were given the officers report along with other documents to include a program of sessions and events, a directory of committees, a book of resolutions and supplemental reports that would be prepared during the convention as needed. All in all a very overwhelming experience for well over half of the delegates being their first time by show of hands. In the afternoon we held the first election for IP, won by Newton Jones with 87% of the vote to defeat Local 83 member Darryl Manroe. In the 3 other contested elections, International Secretary-Treasurer William Creeden received 86% of the vote to defeat local 104 Business manager Brian Opland, International Vice President for Canada, Joe Maloney received 89% of the vote to defeat local 359 Assistant Business Manager Ken Noga, and International Vice President for the Northeast Dave Haggerty Received 95% of the vote to defeat local 29 President Mike Hancock. Three International officers faced no opposition and were elected by acclamation, Larry McManamon – IVP Great Lakes, Tom Baca- IVP Western States, and Warren Fairley IVP Southeast. A motion to withdraw delegates-at-large credentials was defeated, following discussions about the importance of experienced and knowledgeable International reps and other International staff having a voice at convention. A motion to switch to electronic voting was withdrawn after discussions about cost, difficulties for those not familiar with electronic devices and the need for delegates to speak their minds on the floor rather than press a button. A motion to require that International Vice Presidents be elected only by the members from their IVP section failed, following debate over whether that would divide the union. A motion to require that International Officer vacancies be filled by an election of all members rather than being appointed was defeated, as delegates debated the issues of cost , delays in filling vacancies, and other issues. An amendment to that amendment also failed. Also defeated were motions to require the election of International Representatives and reducing severance pay for International Officers. Day four included the last guest speaker Michael Hayes, Director of the Office of Labour-Management Standards at the Department of Labour, addresses delegates on this final day of the convention regarding the DOLs new “Persuader Rule.” The rule requires employers who hire union-busting consultants, and the consultants themselves to file reports on their indirect activities. Hayes said that the main purpose of the rule was to give employees who are considering whether to join union information about any third party that has been hired to dissuade them from organizing. 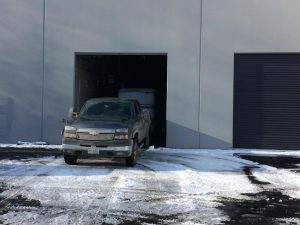 “We thought that it was right that [employees] should be able to access information about the anti-union messages that they are repeatedly hearing and seeing,” said Hayes. Opponents of unions are willing to spend a lot to bust unions and don’t have to report, but unions have to report dollars spent on organizing. This speech was followed by closing remarks and the adjournment of the 33rd Consolidated Convention. For more information on this event, you can visit the IBB website which includes films produced by the International Brotherhood of Boilermakers and Wide Awake Films for the 33rd Consolidated Convention. The elected 359 delegates chosen for this 33rd Consolidated Convention would like to thank all those who voted for them, and greatly appreciated the opportunity to represent this great local as a unified team. As many of our members are aware, there were a series of unfortunate incidents that occurred during the Pine River Turnaround in July 2014. Included in these incidents, were 3 individuals who had initiated exposure claims, two from the day shift and one from the night shift. All of the claims were protested by the employer and subsequently denied by WCB. A very lengthy process was then undertaken and the appeals of these claims began. The Union has now been able to successfully appeal the two day shift claims with the night shift claim unfortunately remaining unchanged. It was through the gathering of pertinent medical evidence at the time of injury that the two individuals were eventually able to succeed with their appeals. The night shift member unfortunately did not have the same evidence of exposure, and more importantly lacked the required medical information that would have possibly allowed the decision to be varied in the form of acceptance as well. 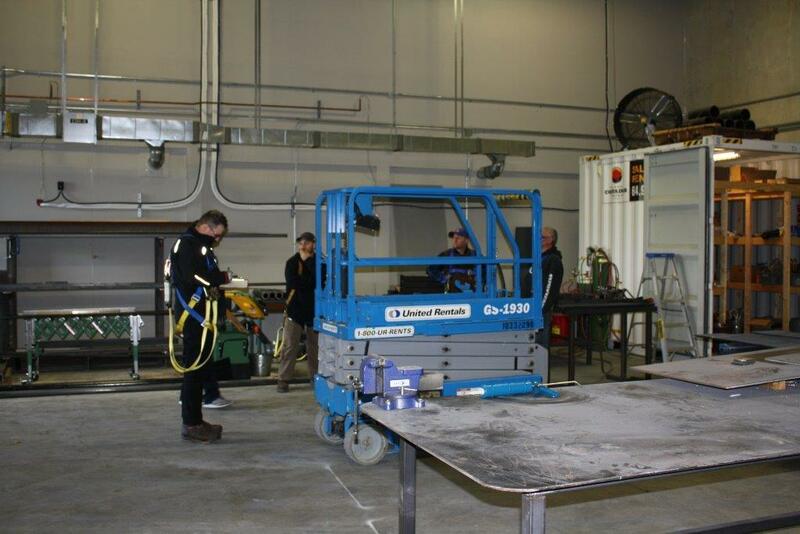 This is a reminder to all members who may suffer an injury or suspect they have been exposed to a toxic substance to immediately report to on site first aid and your employer. Then if your situation warrants a trip to a local practitioner or hospital, ask for any testing you feel should be done. This means if you believe you have been exposed to a substance at a work site you should request blood tests immediately and if possible explain to the doctor what you think you may have been exposed to. If you find yourself in a position of being unsure of what to do, request that you have a job steward present or contact the Union and speak to a representative. The worst thing a member can do is hope that an injury/illness gets better on its own and wait to report it. This tends to be the starting stages of what can be a very lengthy and frustrating appeal process should an employer decide to protest the claim being made. More often than not claims that are not reported at the time of the incident are contested by the employer and quite possibly denied by WCB. Any member who feels intimidated or coerced by an employer or their representatives for reporting an injury should contact the Union immediately as this is a violation of the WCB Act. Is diagnosed as a strain/sprain when it is really something more. These situations can be complex and very confusing but it is important to act quickly to deal with them as an un-appealed decision letter can mean that you will have a tough time getting anything accepted in future. When someone goes to their doctor complaining of back pain (whether it’s low back, mid-back, or neck) the doctor is likely to diagnose a sprain/strain. Doctors will tell you that if they hear hoof beats in the woods, they will first assume it’s horses because in most cases it is. However if there are reasons to think it is not horses, thats when they start to consider whether it may be zebras or any other hooved creature. The same goes for back injuries. You will likely be diagnosed as suffering from a strain/sprain and your doctor or physiotherapist will expect it to resolve within 6 to 8 weeks. If your back pain does not resolve as expected however, then you should be sent for the appropriate tests to figure out if it may be something more; for example, a herniated disc. We often have appeals where the family physician has started to suspect that this is the case and has asked the WCB to approve a visit to a specialist. The WCB has a deal with specialists in most fields that will provide expedited appointments so you don’t have to wait so long. Often the WCB refuses to approve a specialist appointment. We can appeal this, but in the meantime you should get your doctor to make a referral under the Medical Services Plan. Although it will take longer, at least you know you will be seen at some point. If you see a specialist and are diagnosed with a herniated disc or some other injury that you and your doctor feel is a result of your work activity, you will need to ask the WCB to accept that condition. If they say no, you should appeal. It is always important to see a specialist when your condition is not resolving as expected. The WCB will often just cut you off and say, your sprain/strain should be healed by now so if you are still experiencing pain, it must be unrelated to your work injury and it’s not our problem. In this case, it is again crucial that you appeal the decision. If you have a herniated disc and the WCB says it doesn’t come from your accident or activities at work and you DON’T appeal, you will be stuck for the rest of your life with a pre-existing non-work-related herniated disc. We can sometimes get around that but it is not easy. The moral of the story is this: back injuries can be simple strains or they can be very complicated. If you hurt your back at work, and the WCB is not accepting it as their responsibility, something is wrong. You need to address that right away. Get some advice, file an appeal, don’t just shrug and give up. It is your right to appeal and you should use it! The Canadian Boilermaker Apprenticeship Awards Banquet was held in conjunction with the Boilermaker owners appreciation day on August 25th in Edmonton. 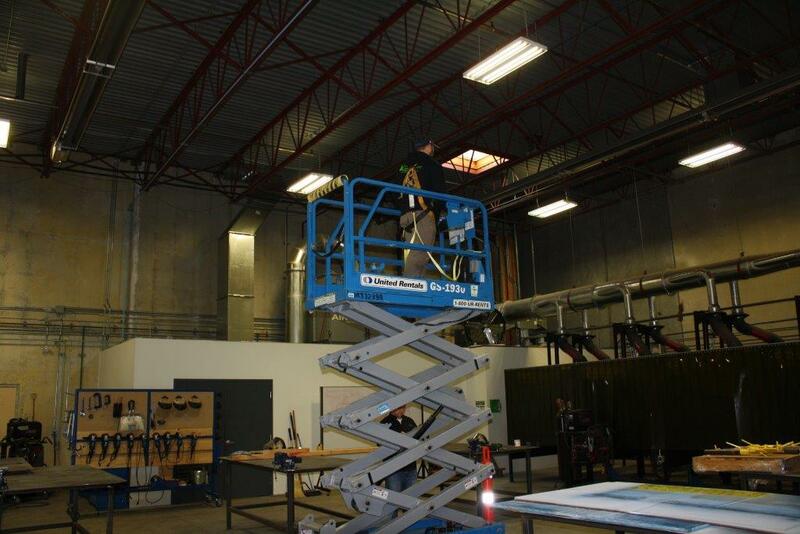 The Banquet and awards ceremony was held to acknowledge the top graduating apprentices from across Canada. Ned Josic was selected as the top Apprentice from Lodge 359 for his in class marks, hard work and attitude. A Boilermaker foundation class graduated from BCIT in August. Top student Mathew Perrin received $500 dollars for achieving the highest marks. A forklift certification course was held on August 23rd with nine members receiving certification. Apprenticeship and Training is now looking after the Pro-Jo program. Pro-Jo inquiries and reports can be sent Gord Weel. The table below represents 5 levels of Apprentice training achieved as compared to the total number of work hours for each level and the number of Apprentices which fall into each level. The table below is the Apprentice training schedule for the remainder of 2016. Mark-up meeting on August 18, 2016 with SNC-Lavalin and Alstom for the Power house T&G portion (3 draft tubes and scroll casings), as the ship just left China with all the pre-fabricated components. Boilermakers to start beginning of January 2017 with back to back shifts for 5 to 6 months with manpower peeking out around 10 to 12 per shift. Canron is to hold a mark-up meeting October 4th for the 3 Bypass Penstocks and scrubbers, said earlier they would have 3-4 members on site possibly in November to start site prep for the January 2017 start. Also with back to back shifts for 6 months plus, and manpower peeking out around 10 to 12 per shift. There is a local hire provision on this job for members who have been a resident for a minimum period of 6 months and within 90 road kilometres of the work site. A copy of the John Hart Dam collective agreement in on our website under the membership tab. Voith Hydro was awarded the Turbines & Generators contract on April 06th. The Penstocks have not been awarded at this point (but lets keep our fingers crossed that this work is awarded to a signatory contractor). The peak potential for manpower is estimated around 35 boilermakers per shift starting approximately mid 2018 for up to 5 years, again with local hire provisions. Local 128 is accepting applications for nuclear security clearances which can take 3-6 months to process for a lot work starting next year especially for welders, at the Bruce, Pickering and Darlington nuclear generation stations. For more information call 128 main office in Burlington. Lodge 359 would like to sincerely thank all those who generously contributed to this years golf tournament. We had a perfect golfing day unlike the previous year, the prizes and dinner this year were simply amazing. A special thanks goes out to the staff and management of Pagoda Ridge Golf Coursefor hosting the tournament. This years 50/50 draw was in support of the Juvenile Diabetes Research Foundation. Boilermaker Mark Oake won the draw in the amount of $955.00, a cheque for the same amount has now been forwarded to the Foundation.